NASA had a number of requirements for its $20.6 million project at the Ames Research Center. Fast Company was on hand as the future-looking designers explained the ideas behind the ultra-green, experimental building. Here’s what we learned. It’s not surprising that forward-looking NASA recently set out to build the federal government’s most sustainable building. 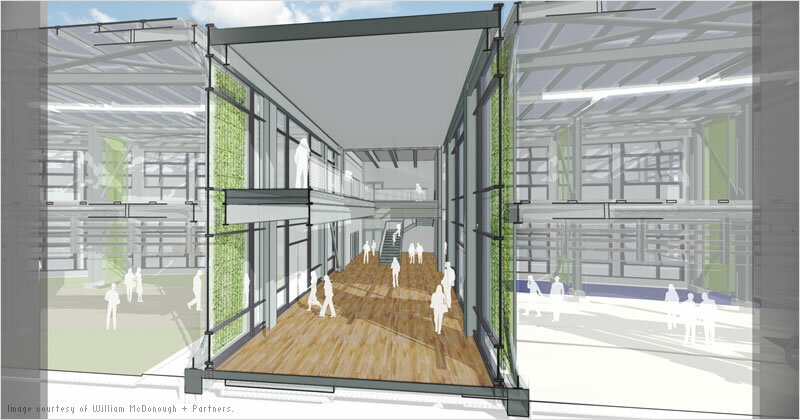 What is surprising, however, is that this ultra-green experimental building, dubbed the Sustainability Base, will open its doors in May of this year–just two years after construction began. This week, we had the chance to sit in on the Autodesk Sustainability Summit and listen to some of the people involved in the planning process explain what went into NASA’s newest Moffett, Calif., building. Here’s what we learned. NASA’s had a number of requirements for its $20.6 million, Ames Research Center-based building: a healthy working environment, excellent air quality and natural light, low energy use, intelligent controls, a flexible building system, the integration of NASA’s emerging technology, and the most challenging requirement of all–LEED Platinum status as a baseline for sustainability. who helped design the project. One of the biggest challenges for AECOM was figuring out how to use the building’s ceiling as an energy source–one of NASA’s requests. Whatever system was chosen had to work in a climate that could start out at 60 degrees in the morning, shoot up to 100 degrees in the afternoon, and then drop back down in the evening. The solution: radiant ceiling panels in office spaces, heating panels on side walls, and raised floors to offer easy access to utilities. 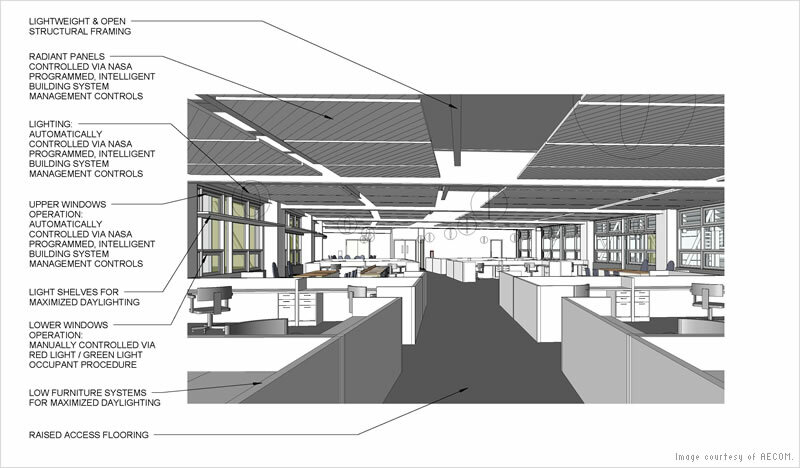 In non-office spaces that won’t always be occupied, AECOM chose radiant concrete floors and natural ventilation. And of course, plenty of futuristic NASA technology was added into to the building. “The idea was, what if we could imagine NASA’s first space station on Earth?” explains David Johnson, a partner at William McDonough + Partners. NASA-designed technology in the building includes the intelligent building controls, an inductive monitoring system that detects when something in the building isn’t working, and a forward osmosis water recycling system originally designed for the International Space Station. The building will use 90% less potable water than a similarly sized conventional building. NASA’s Sustainability Base will also create 22% more energy than it concerns thanks to a combination of solar panels, a Bloom Box fuel cell device, and a geothermal system that will send naturally cooled ground water to interior ceiling panels. And this is just the beginning for the test bed building. “NASA is going to have a building used to develop and test technology that will carry on for 50 to 100 years,” Johnson says. Regardless of whether NASA continues ambitious missions into space, then, the agency will at least have a rich source of innovation on Earth.